This morning BR came down stairs. He looked at my wife and I who were sitting and talking on the couch discussing our daily plans like football coaches game planning for the upcoming foe. Anyway, he had a smirk on his face even as he was wiping the tired out of his eyes, and he said, “It’s tomorrow, today.” He said it a second time, and that seemed to be his whole message. He was that excited for the trip we have planned to a water park later in the week. 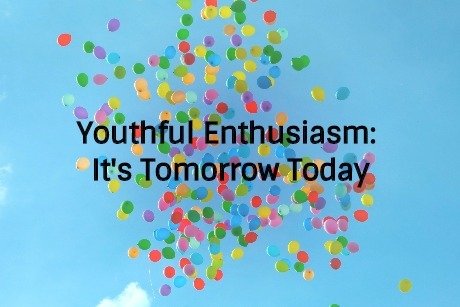 Youthful enthusiasm. SJ will be celebrating his 5th birthday in November. It’ll be his first birthday party we are making for him that will include his friends. He’s talking about this party incessantly and invites and uninvites me on a regular basis. According to SJ, the birthday is tonight, and it should have been every night of the last two weeks. This morning I showed him a calendar. We sang the months of the year song that he learned in school. I then showed him that there are many days till his birthday. He shook his head indicating that he understood. Skip a beat. A moment later SJ informed that his birthday party was tonight. Palm slap right to my head. This kid ain’t gettin’ it. But then I realized why he is not getting it – it’s about youthful enthusiasm. It’s tomorrow today. Both boys are experiencing pure and utter joy – like only the young can. Beautiful, just beautiful! So, while I really would love that full head of hair, I want what my children have. We adults no longer experience the pure and utter joy of youthful enthusiasm. I hope BR and SJ can retain that joy of youthful enthusiasm for as long as possible, and I’ll be content to live vicariously through them. Photo by Luca Upper on Unsplash. This entry was posted in Family and tagged Children, family by lardavbern. Bookmark the permalink. Sounds great Kate. You must have had a great time then. Keep up that enthusiasm!